Nestled into the side of a canyon for over 1,000 years, Montezumas Castle is a 20-room building that once housed the local Sinagua people. 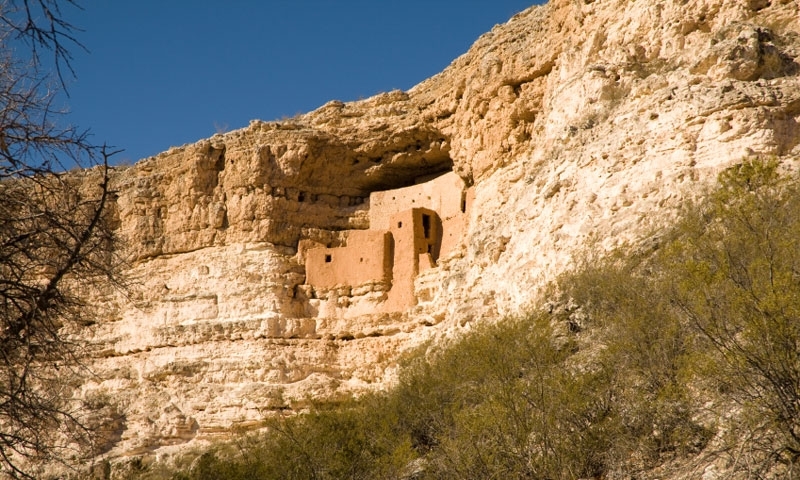 An amazing monument nestled right into the side of a cliff, Montezuma Castle is a spectacular vision and testament to those who lived here before us. An easy day-trip from Prescott. Great opportunity to get a better appreciation of those who settled in the Arizona desert over a thousand years ago. Keep an eye out for local wildlife! What can I see/do at Montezuma Castle? History: Walk on the very same earth that the earliest inhabitants of the area walked on. Sight-seeing: Take in the beautiful surroundings around you, from the limestone cliffs to the deep canyons and blue skies. Wildlife: There is plenty of wildlife to be seen in these parts – just be careful that one of the animals you see isn’t a rattlesnake, which do inhabit this area. It is located at 2800 Montezuma Castle Highway, in Camp Verde. To reach the monument, head up Highway 69 out of Prescott, take a left onto Interstate 17, head north until you reach Exit 289. Turn left on Montezuma Castle Road. When is the monument open? Year round from 8am-5pm. Closed on Christmas Day. Admission into the monument runs $10 for individuals 16 and over, and is free for those under 16. Contact the monument directly at 928-567-3322.